My fiance is leaving today to go offshore for the next couple of weeks. That means he will miss my July 9th birthday, so I got my present today. He got me a KitchenAid stand mixer! I’m so unbelievably excited! I’ve been lusting after them for quite some time. I seriously thought about buying one during Black Friday last year. My fiance must have really been paying attention then, because I think that is the only time I’ve ever mentioned them to him. In addition to the mixer, he got me a Perry the Platypus plush toy. We are slightly addicted to Phineas and Ferb. 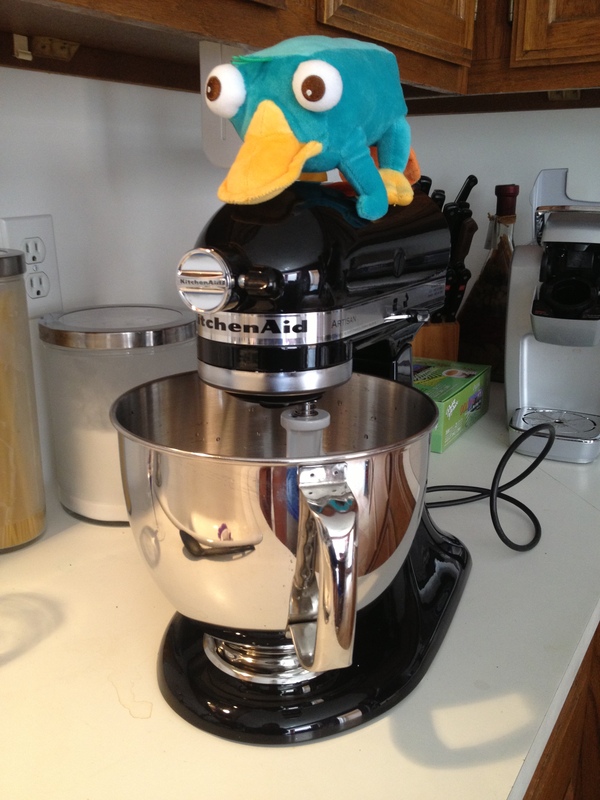 Perry helped me make peanut butter cookies with the mixer this afternoon. I couldn’t stand not playing with it, and I had the ingredients for cookies. The cookies turned out a little dry, so I’m not sharing the recipe. The mixer was great! It comes with a chute that helps to easily pour ingredients into the bowl during mixing. It thoroughly mixed the ingredients without me having to manually scrape the bowl. Clean up was also a breeze. I think I’m in love. I’ll have to buy some ingredients so I can play with its other functions.